Scott McTominay is not leaving Manchester United, Ole Gunnar Solskjaer said. 8.30pm Fulham have agreed a deal with Chelsea to sign Gary Cahill, Sky Sports News understands. 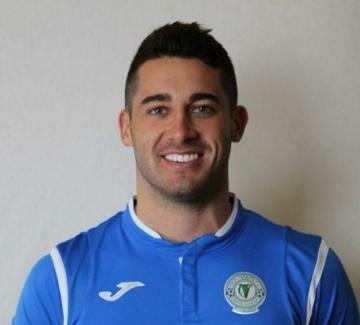 Former Balzan Harry Ascroft has joined Finn Harps of Ireland. 7.30pm Ireland's Finn Harps confirmed the signing of Harry Ascroft subject to international clearance. The Australian born 23-year-old central defender, who can also play at right-back, is joining from Maltese Premier League side Balzan. Ascroft is looking forward to the new challenge in the League of Ireland. Ascroft moved to the Netherlands in 2013 to play for VVV-Venlo in the Eerste Divisie for two years. The 23-year-old returned to Australia in 2015 to play for Central Coast Mariners. 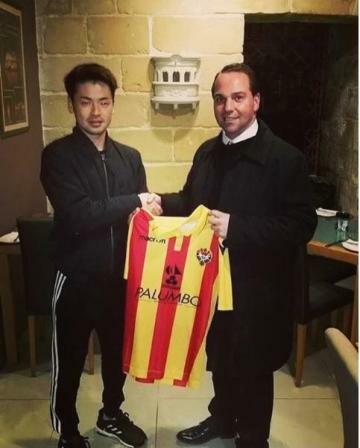 Last January Harry signed for Maltese club Balzan. 6.50pm Multiple sources claim Milan could secure Krzysztof Piatek from Genoa for €40m tonight, freeing Gonzalo Higuain for a Chelsea medical tomorrow. Rossoneri director Leonardo met with Genoa director of sport Giorgio Perinetti this afternoon to discuss the proposal. It’d be a loan deal with obligation to buy at the end of the season for €40m plus bonuses. There was a big step forward this evening when Genoa President Enrico Preziosi arrived to join the summit, meaning contract signatures are imminent. Sky Sport Italia, Sportitalia and more all point to this meaning Higuain will be free to leave Milan tomorrow morning and undergo a medical at Chelsea. 6.30pm Genoa have asked Juventus for Marko Pjaca, who is currently struggling for playing time on loan at Fiorentina. According to Sky Sport Italia, the proposal was put forward during today’s negotiations over a series of transfer deals. Stefano Sturaro is on his way to Genoa on loan with €8m option to buy at the end of the season. 6.10pm Inter are close to securing Nicolò Barella by helping Cagliari to sign Nahitan Nandez from Boca Juniors, claim Sportmediaset. Last week, Barella had seemed to be in the middle of a bidding war between Chelsea and Napoli. However, the situation has changed and Inter now appear to be the favourites for the 21-year-old Italy international. The key to Barella is helping Cagliari to bring in his replacement, specifically Uruguayan Nandez from Boca Juniors. 5.55pm Milan are meeting Genoa and Krzysztof Piatek’s agent, which would send Gonzalo Higuain to Chelsea and Alvaro Morata to Atletico Madrid. Multiple sources confirm Rossoneri director Leonardo, Genoa director of sport Giorgio Perinetti and Piatek’s agent met this evening to negotiate a fee for the hitman. The offer on the table is to take the Poland international on loan until the end of the season with obligation to buy for a total €40m plus performance-related bonuses. Piatek would earn €2m per year on a contract to June 2023. Chelsea striker Alvaro Morata has reached a personal agreement to join Atletico Madrid, says Spanish football expert Guillem Balague. 5.25pm Chelsea striker Alvaro Morata could be on is way out of Stamford Bridge this month, with Atletico Madrid understood to be interested in him. Sarri admits he is unsure if he will play against Arsenal on Saturday but said he has sympathy for the player and the current uncertainty over his future. “I don’t know if he will play against Arsenal but he is training with us." Real Madrid will launch a bid to sign Éder Militão from Porto this month. The 20-year-old currently has a £45m release clause in his contract but that rises to £66m in the summer. 4.50pm Real Madrid will launch a bid to sign Eder Militao from Porto, according to AS. However, the centre-back is also a target for Manchester United, Liverpool and Chelsea. The 20-year-old currently has a £45m release clause in his contract but that rises to 66m in the summer. Should Real miss out on Militao, they remain interest in Mario Hermoso, reports AS. 4.35pm Tottenham Hotspur boss Mauricio Pochettino has ruled out making a move for ex-Fiorentina and Italy forward Giuseppe Rossi this month. Rossi had been mentioned as a possible solution to Tottenham’s striking crisis, which has stripped them of Harry Kane and Son Heung-min, given the 31-year-old is currently a free agent and in England training with former club Manchester United. However, Pochettino said at a press conference: “There are many names that appear in every transfer window. “I think he is another name to add on the list but it is only a rumour. We have not considered him. 4.15pm Pep Guardiola has been fielding questions on Manchester City’s plans to find a long-term replacement for Fernandinho. “I think with the way we play we need a guy who has of course physicality, is quick in the head and reading where our spaces to attack are. As many things as he can do, the better. I know it is not easy to find one player who can do everything. 4pm Paris Saint-Germain have reportedly dived in front of Chelsea with a €35m bid for Zenit St Petersburg midfielder Leandro Paredes. According to Gianluca Di Marzio’s website, PSG have taken advantage of Chelsea’s failure to submit an official offer for Paredes. However, the Sky Sport Italia journalist warns Zenit are continuing to demand €40m for the ex-Roma man, who also played under Blues boss Maurizio Sarri at Empoli. Nonetheless, it could see Sarri’s side revive their interest in Nicolo Barella, although the Cagliari starlet is thought to be valued in the region of €50m. 3.30pm Cagliari defender Fabio Pisacane has ended speculation about his future by signing a new contract with the Sardinians until 2020. Pisacane had been linked with January moves to Udinese and Sassuolo, but Cagliari confirmed on Friday that Pisacane had put pen to paper on a renewal, which includes the option for an extra season. The 32-year-old has played 98 times for the Rossoblu since signing from Avellino in 2015, scoring three goals. He gained recognition earlier in his career for turning down a bribe to throw a match and overcoming Guillain-Barre syndrome. 3.00pm Milan have reportedly denied claims that Gonzalo Higuain bid farewell to his teammates on Thursday evening. Several Italian publications reported Higuain had held a farewell party ahead of his likely move to Chelsea. However, MilanNews has countered with a rebuttal, citing confirmation from the club that there was no such party. Instead, the Juventus loanee would have dined with his colleagues to celebrate Samu Castillejo’s 24th birthday. 2.45pm Marc Albrighton has signed a new contract at Leicester City that will run until June 2022. The 29-year-old has made over 170 appearances for the Foxes, including all 38 of their Premier League title-winning campaign in 2015/16. “It was totally straight forward,” he told LCFC TV. 2.30pm Yohan Benalouane has left Leicester City to become Martin O’Neill’s first signing at Nottingham Forest. The 31-year-old Tunisia international has signed an 18-month contract at the City Ground. ???? [MD] | Barça has already ruled out the option of loaning Morata because of economic demands and because the player wants guarantees for minutes. ???? The club does not want a compulsory purchase option. 2.15pm Barcelona have spent January searching for a striker and, with a move for Chelsea’s Alvaro Morata now unlikely, the La Liga leaders are considering Carlos Vela, reports Marca. The Mexico international, who plays for Los Angeles FC, has been offered to the club and could return to Spain this month. Andrei Spiteri is set to join Hibernians next week. 1.45pm Andrei Spiteri is set to end his spell with Spanish side Leganes and return to Maltese football with Hibernians. 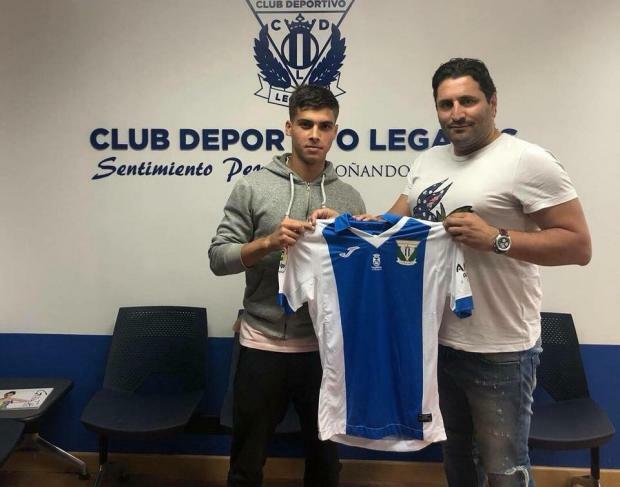 The Malta U-19 international player joined Leganes at the start of the season but has now been offered the chance to return to Maltese football and will join Hibernians. The young player will put pen to paper on an 18-month contract and his transfer should be sealed next week. 1.30pm Genoa striker Krzysztof Piatek will reportedly be free to join Milan once CEO Ivan Gazidis gives the green light. According to Gazzetta dello Sport and Sport Mediaset, Milan sporting director Leonardo will meet Genoa president Enrico Preziosi to apply the finishing touches to negotiations. In the meantime, however, the last ‘obstacle’ would come from Gazidis, who has yet to approve of the Pole’s arrival. Nonetheless, Sport Mediaset assures Leonardo ‘has studied everything in the smallest detail’ and found the ‘right’ formula to not only appease Preziosi but also satisfy Financial Fair Play. 1.15pm Sampdoria striker Gregoire Defrel is reportedly on the verge of joining Premier League side Newcastle United. According to ANSA, Newcastle are ‘very close’ to agreeing a €15m deal for Defrel, who has since been replaced at Samp by Manolo Gabbiadini. The Frenchman scored 23 goals in 73 appearances for Sassuolo before moving to Roma for €20m in the summer of 2017. However, injuries and constantly being played out on the right as opposed to his favoured position of centre-forward saw him score just once for the Giallorossi. 1pm Tottenham are set to turn to Giuseppe Rossi to ease their striking crisis, according to Tuttosport. The Italian has been training with Manchester United and Spurs are considering offering him as pay-as-you-play deal. Spurs’ attacking options have been hit by Harry Kane’s ankle injury, which has ruled him out until March, and Heung-min Son’s departure for the Asia Cup. 12.40pm Rangers striker Ryan Hardie has signed a one-year contract extension which will keep him at Ibrox until the summer of 2020. Hardie, 21, will return to Scottish Premiership rivals Livingston on loan until the end of the season before joining up with Steven Gerrard's side in the summer. The Rangers academy product has played seven games so far this season, scoring five goals in his last five appearances. 12.20pm Milan striker Gonzalo Higuain could reportedly undergo his Chelsea medical on Friday as he prepares to fly to London. According to Corriere dello Sport, Higuain is all set to join Chelsea and only the formalities of his medical and signing a contract need to be completed. Furthermore, Milan are in ‘constant contact’ with Genoa for Krzysztof Piatek and a deal will ‘go through’ once the Juventus loanee lands in London. The newspaper does not disclose the terms of the 31-year-old’s move to Stamford Bridge, but he is expected to join the Blues on an initial loan until the end of the season with the option for a further campaign. Andre Scicluna (second left) with Ħamrun president Nunzio Antignani, coach Giovanni Tedesco and team manager Gaetano Farrugio. 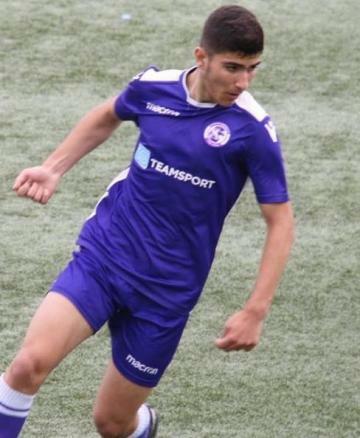 11.50pm In a confirmation of the news broke out by the Times of Malta, Ħamrun Spartans have confirmed the signing of Andre Scicluna from Tarxien Rainbows. The lateral defender has put pen to paper on an two-and-a-half year contract and is in contention to make his Spartans debut this evening when they take on title challengers Gżira United. The Spartans have also issued a statement where they denied reports that they are interested in signing former Birkirkara goalkeeper Miroslav Kopric. 11.30am Senglea Athletic have paraded their latest signings on Thursday. Goalkeeper Zach Valletta moves to the Cottonera outfit from Lija Athletic. The 25-year-old struggled for first-team football at the Division One club, making only three appearances for the club. The Premier League strugglers have also brought in Japanese player Taisei Marukawa. Marukawa has joined the Cottonera club until the end of the season. 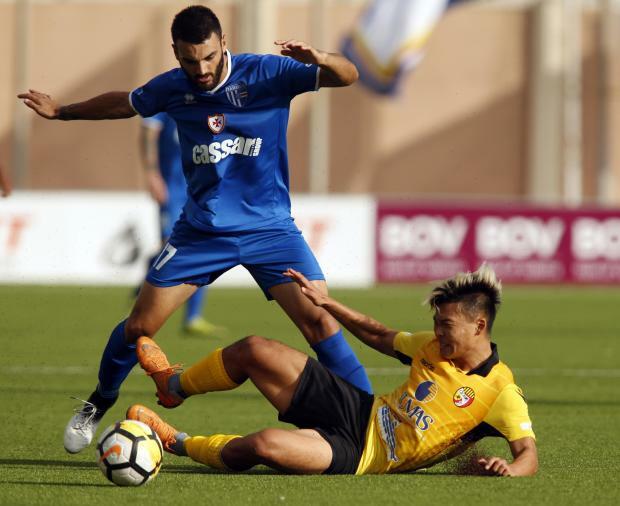 Valletta and Marukawa are expected to be in contention for the Cottonera side for Saturday's Premier League match against Mosta at the Hibernians Stadium where they will be looking to pick up more valuable points. But it looks like Scott McTominay is going nowhere this month. 11.15am Ole Gunnar Solskjaer has poured cold water on the possibility of Scott McTominay, who has been linked with Celtic, leaving Manchester United on loan this month. 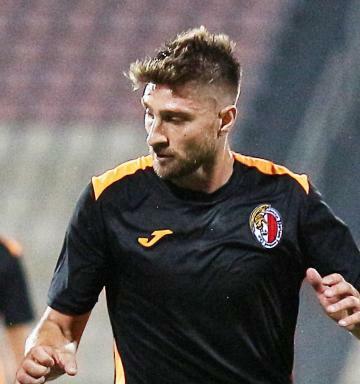 11.05am We kick off the day with a positive news for a young Maltese player as Mattija Veselji is set to continue his career in Serbia with OFK Belgrade. The 16-year-old underwent a trial at the Serbian club in November and is said to have impressed the Serbian club's coaching staff who offered Veselji a contract. It is understood that Veselji is joining the Serbian club on loan basis but club vice-president Jason Falzon is giving all the support needed to the player in this new adventure and is hoping that the transfer becomes permanent at the end of the season. Veselji, despite his young age, has already shown a lot of promise at St Andrews and has also made his Premier League debut with coach Johann Scicluna this season. 11am Good morning everyone and welcome to our transfer blog. Stay with us to follow all the latest news from the BOV Premier League and the European leagues. Real Betis had reportedly enquired Inter about bringing in Martinez, given their lack of attacking firepower and the Argentine struggling for game time at San Siro. However, Beto Yaque told FCInterNews.it: He’s always been happy. Then of course, like any footballer when he doesn’t play, let’s say he was a bit agitated. 8.15pm Derby are in talks to sign Ashley Cole. Cole is a free agent after leaving LA Galaxy in Nov 2018 and was a former team-mate of Derby manager Frank Lampard at Chelsea. Derby have today allowed left-back Max Lowe to return to Aberdeen on loan for the rest of the season. 7.50pm BOV Premier League champions have announced the signing of midfielder Antonio Monticelli. 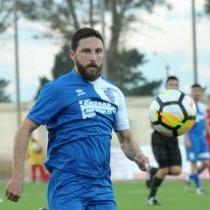 Earlier today, the Times of Malta had reported that Monticelli acquired his release from Ħamrun Spartans after he was approached by the Malta champions. The Italian midfielder appeared 11 times during the 2018/2019 domestic championship for the Spartans. “He might be from Glasgow originally, but everything about him screams Liverpool." ???? The boss on @andrewrobertso5. ???????? 7.45pm Andrew Robertson has signed a long-term contract extension with Premier League leaders Liverpool. Sky Sports News understands the 24-year-old's new deal ties him to the club until the summer of 2024. 7.15pm Fiorentina have reportedly rejected Zenit St Petersburg’s bid to take defender David Hancko on loan with a €20m option to buy. According to Gianluca Di Marzio’s website, Zenit offered €500,000 to loan Hancko until the end of the season and €20m to sign him permanently in the summer. However, the Sky Sport Italia journalist notes Fiorentina knocked back the proposal as they ‘believe’ in the Slovak’s potential. 7pm Macclesfield Town have confirmed that former Manchester United and England striker Andy Cole has joined Sol Campbell’s coaching staff on a part-time basis. 6.30pm Tottenham confirm departure of Mousa Dembele to Chinese club Guangzhou R&F. Cardiff City have agreed terms with Everton on a loan deal for striker Oumar Niasse. 5.45pm Out-of-favour Everton striker Oumar Niasse is edging closer to a loan move to Cardiff. The 28-year-old Senegalese has had a bit-part role at the club since arriving in a £14m deal in January 2016, going out on loan to Hull two years ago. He has made just seven appearances this season, with only one start, and has featured in the matchday squad just 10 times in 25 games this season. BREAKING: @CelticFC midfielder @ScottAllan_ has signed a pre-contract agreement with @HibernianFC. Neil Lennon: "It’s no secret that Scott is a player I admire and wanted back." 5.25pm Celtic midfielder Scott Allan has signed a pre-contract agreement with Hibernian. Allan, who has already had two spells with the Edinburgh club, will join in the summer on a three-year deal. The 27-year old was PFA Scotland Championship player of the year in 2015 during his first spell with the club. Allan returned to Easter Road last January, scoring three goals in a 12 game loan spell. 5pm SPAL have officially terminated the contract of former Arsenal defender Johan Djourou. A statement on SPAL’s official website also thanked Djourou for ‘the professionalism and dedication shown in his few months as a SPAL player’. The Switzerland international, who turns 32 on Friday, only joined the Ferrara side last summer but went on to make just five Serie A appearances. 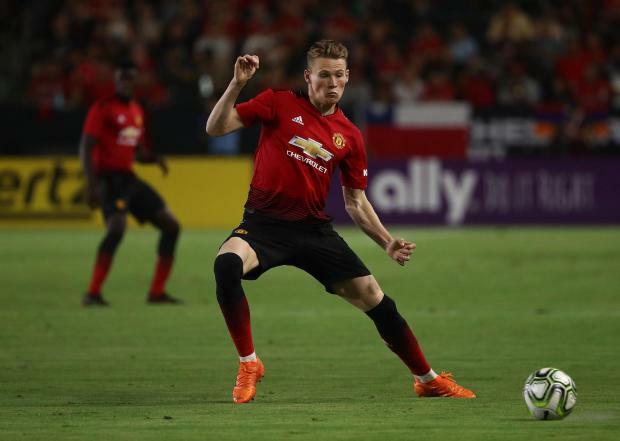 Manchester United are considering whether to loan out Scott McTominay with interest from clubs in England and Scotland, @SkySportsNews understands. 4.30pm Celtic are continuing negotiations with Manchester United over a loan deal for midfielder Scott McTominay, Sky Sports News is reporting. The 22-year old Scotland international is understood to be available on loan, having failed to feature in the first team since Jose Mourinho’s departure last month. Celtic have brought in three new signings so far this window – with two American players, Manny Perez and Andrew Gutman, also expected to join. Hammers tracking Krzysztof Piatek but Genoa will demand €50m for star striker. Piatek has struck 19 goals in 21 appearances in all competitions this season. 4pm West Ham have met Genoa’s £35million valuation of striker Krzysztof Piatek but the Serie A side have rejected the offer as they have guaranteed AC Milan first refusal on the 23-year-old, reports Sportitalia. Piatek has agreed terms with Milan, according to Gazzetta dello Sport, so it’s now just up to the two Italian clubs to reach a deal that the two sides agree with. 3.30pm Aaron Ramsey completed a medical over the weekend ahead of his summer move to Juventus according to Sky in Italy, who suggest the Serie A leaders will announce his signing next month. 3pm Naxxar Lions have signed Brazilian striker Edson Cerqueira Farias until the end of the season. The 22-year-old forward arrived in Malta earlier this month and initially was training with Premier League club Mosta. However, the Blues opted to sign Duane Bonnici from Naxxar Lions earlier this month. 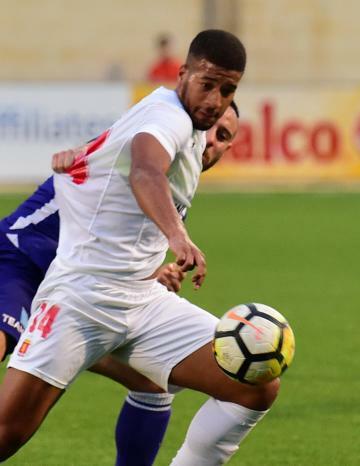 With Farias' chances of a winning contract with Mosta limited, the Brazilian finished a target for Naxxar who offered him a contract as they looked to fill the void left by Bonnici. 2.40pm Manchester United will sign teenage attacker Noam Emeran from Ligue 1 side Amiens by the end of January, French publication Courrier Picard is reporting. The 16-year-old, who will set United back by around £90,000, has also been followed by Juventus and Paris Saint-Germain. 2.20pm Antonio Monticelli is no longer a Ħamrun Spartans player. The Italian midfielder joined the Spartans at the start of the season and had been a regular member of Giovanni Tedesco's squad. However, since the turn of the year, the player has expressed his intentions to seek pastures new and wanted to join champions Valletta. The Spartans were not ready to keep a player who didn't want to play for the club and after holding talks with the former Floriana player they reached an agreement so that his contract is terminated. Monticelli made 11 appearances with the Spartans this season as the Reds step up their challenge for a top-four finish. 2.05pm Krzysztof Piatek has reportedly agreed terms with Milan, who must now work out a deal with Genoa. According to Gazzetta dello Sport, Piatek is ready to put pen to paper on a five-year contract with Milan, despite late interest from West Ham United. It would see the striker earn €35,000 a week after tax for the rest of the season and then €40,000 from the following campaign, as well as include ‘significant bonuses’. The newspaper explains all that is left is for the Rossoneri to thrash out an agreement with Genoa. 1.45pm Valletta striker Kyrian Nwoko is heading to England at the end of this month to undergo a trial at Scunthorpe United. The former Malta U-21 striker had been looking to pursue his career abroad and at the end of last year it was revealed that the League One side had put their eyes on the young forward. At the start of this month, Valletta had decided to keep all their players but have now given their go-ahead so that Nwoko can go for a trial with Scunthorpe as they have no plans of stopping the youngster to earn a contract abroad. Nwoko will be in Valletta's squad for Sunday's top-of-the-table clash against Hibernians at the National Stadium. The 21-year-old joined Valletta from St Andrews in 2017 and this season he made 10 appearance with the Malta champions and has two assists to his name albeit he is still seeking his first goal. Uchenna Calistus (second left) poses with Pieta president Mario Mallia (second right) during his presentation. 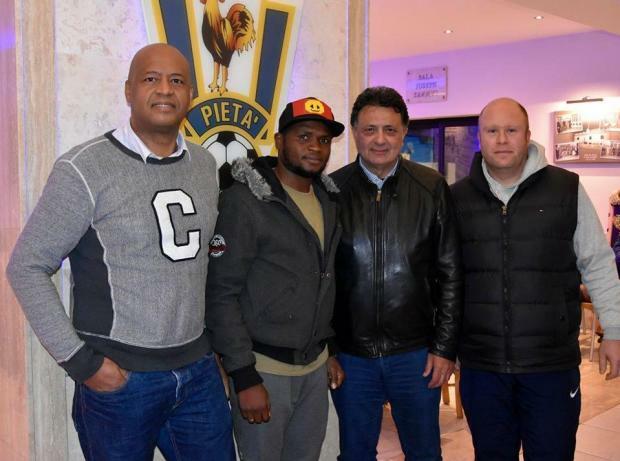 1.30pm Pietá Hotspurs have signed their second overseas player this week when they handed a contract to Nigerian Uchenna Calistus. Calistus started the season on the books of Birkirkara but the Nigerian struggled for first-team football and had his contract terminated late last year. The Hotspurs, who are trying to retain their status in the top flight for another season, approached the player who agreed to join the newly-promoted side for the rest of the season. Calistus is the second signing for Pieta this week after on Wednesday they signed Serbian defender Stefan Radovanovic. 1.15pm Tottenham are considering Liverpool striker Divock Origi as a temporary replacement for Harry Kane, reports the Daily Star. The England's captain has been ruled out until March with an ankle ligament injury sustained in Spurs’ defeat to Manchester United on Sunday. Kane’s injury leaves Spurs short of attacking options, Lucas Moura injured and Son Heung-min is away at the Asia Cup. It means Mauricio Pochettino could pursue a short-term deal for Belgium international Origi as he desperately looks for reinforcements. 1.00pm Manchester United and Chelsea are set to fight over the signature of Crystal Palace defender Aaron Wan-Bissaka this summer, according to the Daily Mirror. The 21-year-old right-back has caught the eye with his seamless adaptation to Premier League football, cementing his place in Palace’s first-team. Manchester City have reportedly kept tabs on the England U21 international and now United and Chelsea have followed suit. 12.45pm David De Gea is ready to commit his future to Manchester United, reports The Sun. The Spain international is under contract at Old Trafford until 2020 after United triggered a one-year extension in his contract in November. Securing the goalkeeper’s long-term future has remained a priority since, and The Sun claim United’s hopes extending De Gea’s stay have been boosted by the sacking of Jose Mourinho. It is understood De Gea believes his trophy hopes have been boosted since the sacking of the Portuguese. 12.30pm Manchester City have opened talks with Hadjuk Split for a £7m deal for Ante Palaversa, according to the Daily Mail. The 18-year-old Croatian is viewed as a possible long-term replacement for Fernandinho. 12.15pm Atletico Madrid are in advanced talks to sign Chelsea striker Alvaro Morata, according to Sky sources. Chelsea would prefer a permanent deal, with the club eager to recoup as much of their investment back as possible, having signed Morata for a club-record £70m from Real Madrid less than two years ago. Morata, who Chelsea value at £45m, wants to return to Madrid, but the deal hinges on whether Chelsea can bring in a replacement. 12.00pm Chelsea have agreed a deal with Juventus to sign Gonzalo Higuain on loan until the end of the season, reports Sky in Italy. Chelsea head coach Maurizio Sarri is understood to be keen on bringing Higuain to Stamford Bridge, despite concerns from the club's board. Higuain has been on loan at Milan from Juventus since the start of the season, with an option to buy at the end of the season. 11.45am Good morning everyone and welcome to our transfer blog. Stay with us to follow all the latest news from Maltese football and other international leagues. 10.00pm That's it for tonight. Thanks for staying with us and we will be back tomorrow. ???? Herzlich Wilkommen Wöber! ???? 9.30pm Sevilla have confirmed the signing of defender Max Wober from Ajax on a deal until 2023. 9.00pm West Ham have lined up Celta Vigo striker Maxi Gomez as a potential replacement for Marko Arnautovic if he leaves the club. The Hammers held talks with the Spanish side over Gomez in the summer, but felt Celta were demanding too much money for the 22-year-old Uruguay international. 8.45pm Cardiff City have agreed terms with Everton on a loan deal for Oumar Niasse until the end of the season. Chief executive Ken Choo has confirmed to Sky Sports News in the last half an hour that the striker is expected in south Wales later this evening for a medical. Stefan Radovanovic (left) will continue the season with Pieta Hotspurs. 7.45pm Stefan Radovanovic will continue his career in the BOV Premier League as he has agreed to join Pieta Hotspurs. The Serbian defender started the campaign with Tarxien Rainbows but last month he received offers from a number of clubs, including one from Slovakia and expressed his desire to seek pastures new. The Hotspurs were one of two local teams who expressed an interest in the player and they offered him a contract. Radovanovic, after he acquired his release from Tarxien Rainbows, held talks with Pieta and accepted their offer. The player has agreed to join the Hotspurs until the end of the season. Radovanovic is set to make his debut with Pieta when they face Birkirkara on Friday. 7.00pm Chelsea are on the verge of selling Alvaro Morata to Atletico Madrid, but only want to take Gonzalo Higuain on loan from Juventus via Milan, it’s reported. However, with Gennaro Gattuso’s comments over the last few days and reports from various sources, it’s evident Higuain is pushing for a reunion with his former Napoli Coach Maurizio Sarri at Chelsea. 6.45pm Sky sources understand Chelsea are increasingly confident of signing Gonzalo Higuain on loan, with an option to buy. Higuain is not in Milan's squad to face Juventus in the Italian Super Cup tonight. Leeds boss Marcelo Bielsa has called an impromptu press conference at 5pm this evening. The Sky Bet Championship club announced Bielsa wanted to hold an additional media briefing at their training ground. It is not known what Bielsa will say, but he admitted on Friday that he was responsible for sending a member of club staff to watch Derby training on Thursday and both the Football Association and English Football League have launched investigations. 6.15pm Cardiff City close to agreeing deal to sign Emiliano Sala from Nantes, Sky Sports News understand. The fee is in the region of £18m and the hope is that Sala will be in the Cardiff squad for Saturday's game against Newcastle. He has pulled out of the Nantes squad for tonight's game against Nimes. 5.15pm Gazzetta dello Sport reports Chelsea are close to signing Gonzalo Higuain, but the striker was seen with Milan teammates before the Supercoppa. According to La Gazzetta, Chelsea are ‘on the verge’ of closing a deal for Higuain, which has ‘accelerated greatly’ in the last few hours. The Argentine was not included in a Milan team photo just hours before their clash with Juve in Jeddah, followed by reports he would not play because of a fever. 4.30pm Udinese goalkeeper Simone Scuffet has officially joined Kasimpasa on loan until the end of the season. The deal was confirmed on Kasimpasa’s official website, although there is mention of an option to buy. Scuffet broke out in similar vein to Gianluigi Donnarumma, becoming Udinese’s starting goalkeeper at the age of just 17 in the second half of the 2013-14 campaign. 3.35pm Inter are the favourites to land Arsenal midfielder Mesut Ozil in the eyes of British bookmakers. Tuttomercatoweb reported earlier in the week that Arsenal had offered Ozil to Inter and Juventus so they could finance a swoop for Milan target Yannick Carrasco. Despite the German’s €18m salary, Paddy Power is among the bookmakers to have slashed the price on him joining the Nerazzurri this month to 7/1. 3.15pm Ħamrun Spartans have confirmed the signing of wingback Andre Scicluna. 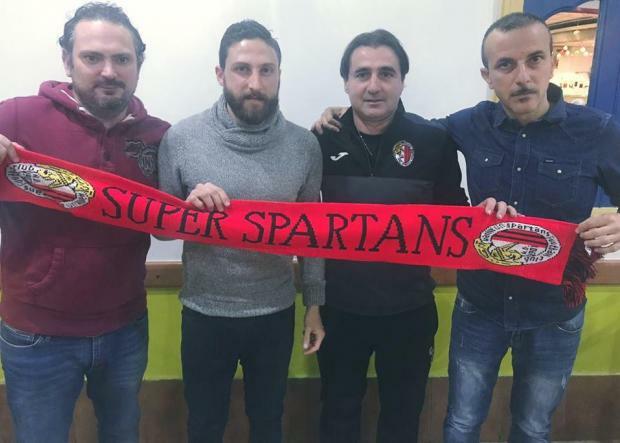 The 30-year-old right back started the season with Tarxien Rainbows but has now agreed to join the Spartans on a three-year contract. Scicluna is the Spartans' first signing during the January transfer window and will surely provide more options to coach Giovanni Tedesco who sought cover for Matthew Gauci and Karl Micallef. Scicluna was due to hold his first training session with the Spartans on Wednesday and could make his debut on Friday when Ħamrun take on Gżira United at the National Stadium.